A dream of racial equality behind the Iron Curtain may seem counterintuitive to Americans today, but for African-Americans escaping the violence and hate at home in the 1920s and onward, immigration to the Soviet Union seemed like a road to long-denied freedom and respect. In this early stage of the Soviet Union, although some measures already curtailed the freedoms previously offered to many minorities after the Bolshevik Revolution, it still appeared as a welcoming land to those marked as second-class citizens in the U.S. When his career goals limited by racism in the American entertainment industry, Rudd moved to the Soviet Union in 1931 to pursue a career on stage and screen. Eventually he graduated from Moscow’s Theatrical Art Institute and worked at the Stanislavsky Opera and Drama Theater. Although many others followed Rudd’s example, he became the face of the Soviet ideological machine in its promotion of racial justice in the Soviet Union and its criticism the injustice perpetrated against ethnic minorities in the so-called “free” West. The Soviet-born, U.S.-based filmmaker Yelena Demikovsky is producing a documentary called “Black Russians – The Red Experience” that addresses this unusual pattern of immigration. In the upcoming film, Demikovsky interviews the descendants of the black American émigrés, including Rudd’s son, Wayland Rudd Jr., a Moscow-based musician, and Russian television host, Yelena Khanga, the granddaughter of a Mississippi cotton farmer and a Polish-Jewish American woman, who relocated to Soviet Uzbekistan. 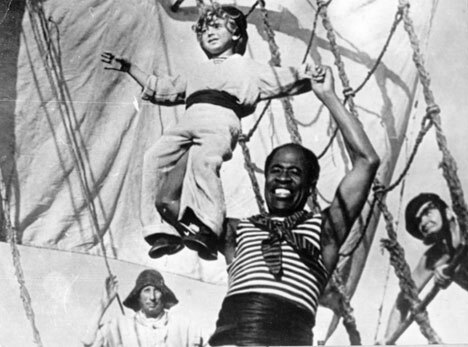 Like many Russians, Demikovsky grew up watching the 1936 Soviet film “The Circus,” in which a young American circus star (Lubov Orlova) performing in Russia initially hides her child from the Russian people, afraid they will condemn her because the father of her child is black. Since the movie’s release, generations of Russians have fallen in love with the mysterious black child, who is widely accepted at the end of the film. For many years, few people knew that the actor, James Patterson, was actually the son of a black American who moved to the Soviet Union and married a Russian. It’s difficult to verify the number of people who left America for the Soviet Union, according to Carew. “Sources indicate that several hundred blacks went for a range of reasons and stayed for varying lengths of time… Additionally, some made more than one trip; and others went and never returned to the United States,” Carew wrote. But their stories must be known. “Such a film is urgently needed today, as it is about people who are unafraid of pursuing their dreams and fighting for their dignity and freedom,” Demikovsky said. The documentary is ready for post-production, but her studio, Red Palette Pictures, is still fundraising. Post-Soviet Russia and the United States still share the bond created by the life stories of Rudd, Patterson, and their contemporaries, who made the brave and controversial choice to move to an unknown, foreign place and create art. This unusual twist in history is still contributing to the forging of new relationships, according to Demikovsky, who befriended James Patterson, now in his 80s and living in the U.S., during her work on “Black Russians – The Red Experience”. “If I only knew when I was little, and loved the boy from the “The Circus,” that one day I’ll become his friend,” Demikovsky said.